G.P. Putnam's Sons, 9780399576416, 368pp. From the award-winning author of You Know When the Men are Gone comes a searing debut novel about jealousy, the unpredictable path of friendship, and the secrets kept in marriage. Two women far from home. One terrible misunderstanding. Both Cassie Hugo and Margaret Brickshaw dutifully followed their soldier husbands to the U.S. embassy in Jordan, but that's all the women have in common. After two years, Cassie's an expert on the rules, but newly arrived Margaret sees only her chance to explore. So when a fender-bender sends Margaret to the local police station, Cassie reluctantly agrees to watch Margaret's toddler son. But as the hours pass, Cassie's boredom and frustration turn to fear: Why isn't Margaret answering her phone? Soon Cassie begins to question not only her friend's whereabouts but also her own role in Margaret's disappearance. 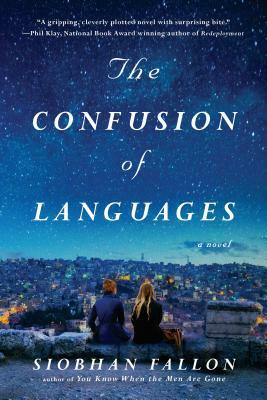 Set within the U.S. expat community of the Middle East during the rise of the Arab Spring, The Confusion of Languages plunges readers into a shattering collision between two women and two worlds, affirming Siobhan Fallon as a powerful voice in American fiction and a storyteller not to be missed. Siobhan Fallon is the author of You Know When the Men Are Gone, which won the PEN Center USA Literary Award in Fiction, the Indies Choice Honor Award, and the Texas Institute of Letters Award for First Fiction. Her writing has appeared in The Washington Post Magazine, Woman's Day, Good Housekeeping, Military Spouse, The Huffington Post, and NPR's Morning Edition, among others. She and her family moved to Jordan in 2011, and they currently live in Abu Dhabi, United Arab Emirates.